Darryl Bereziuk, Director of the Archaeological Survey, speaks with consultants and students after presenting at a meeting. Darryl Bereziuk is relatively new as Director of the Archaeological Survey of the Historic Resources Management Branch—he is just coming up on his first full year in the role. He is no stranger to the branch, however. Prior to becoming Director, he was the Northern Regional Archaeologist for the Archaeological Survey. “So I still worked in this organization, for about eight years. So, you know, I’ve come up through the ranks, so to speak,” Darryl says. The Archaeological Survey Section preserves, studies, interprets, and promotes Alberta’s archaeological resources. Much of Darryl’s job involves overseeing several management systems that have been put in place to protect and mitigate threats to archaeological resources in the province. The first (and fundamental) system is the Alberta Archaeological Site Inventory—what Darryl calls “the heart” of the Archaeological Survey. The section maintains an inventory of more than 40,000 archaeological sites of diverse types: tipi rings, rock art sites, stone feature such as medicine wheels, and quarry sites where First Nations people obtained stone for making tools. Such resources are fragile and easily destroyed by resource extraction and other types of development—and Alberta is a very busy place for that, Darryl notes. The up-to-date inventory helps the Archaeological Survey to fulfill a main part of its mandate: to protect significant archaeological sites that we know about. Various industries must submit their development plans for review as part of the Historical Resources Act (HRA) Regulatory Approval System. If it is considered likely that a development will impact archaeological sites, then a requirement might be issued to conduct an Historic Resources Impact Assessment (HRIA). These field studies serve to identify and assess the significance of archaeological resources before they are impacted by ground disturbance activities. What are Historic Resources Impact Assessments? HRIAs are aimed at examining how potential impacts to significant sites can be avoided or mitigated. The consultants, in Darryl’s words, “examine the potential conflict between archaeological resources and a project’s footprint, and then forward recommendations, on behalf of the industry, for avoidance or mitigation. The Archaeological Survey considers the consultant’s findings and issues a final recommendation.” The final recommendation from the Archaeological Survey might be that there are no further concerns arising from the study, and that development may proceed. Or, the Archaeological Survey might recommend either that the site be avoided entirely, or that industry conduct archaeological excavations of a portion of the site to compensate—with the knowledge gained from the excavation—for destroying the remaining portions. “These sorts of mitigation activities happen on a very regular basis,” Darryl explains. Darryl was a private archaeological consultant himself for about fifteen years prior to joining the government, helping industry clients to fulfill the requirements issued by the section he now directs —the Archaeological Survey. 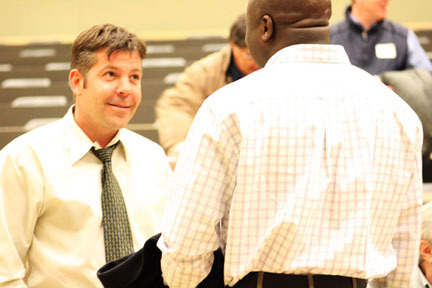 “That knowledge and experience has really served me well in this position,” Darryl remarks. Before undertaking any survey or excavation, an archaeologist must come to the Archaeological Survey for official permission to do the work, triggering the second major management process that the section oversees: the Archaeological Research Permit Management System. “It’s not necessarily the materials in the archaeological site that are important,” Darryl explains. Instead, it is usually the “association of how the materials are distributed across the site that allows you to get at the important information”—that is, what the site has to tell us about past human behaviour or activities. It takes special training to excavate sites to see this larger pattern, and because the act of excavation is destructive in and of itself, the Historical Resources Act requires that anyone conducting an archaeological investigation have a valid permit. Permit holders must have “the appropriate educational training and experience to ensure that the destructive activities that they will be conducting will lead to really good information about that site—and that the information content of the site won’t be inadvertently lost,” says Darryl. In order to make a recommendation that an assessment is needed in light of a proposed development, the Archaeological Survey has to demonstrate that there is a “very high likelihood” that archaeological resources will be impacted. However, archaeologists have surveyed only a small portion of the province and detailed information about site location is sparse for some areas. Accordingly, “we’re always looking at ways to become more sophisticated in making these recommendations” when it comes archaeological sites that are unrecorded, but that undoubtedly hold a wealth of information about the province’s history. The section’s answer to this challenge is to draw on new technologies. The Archaeological Survey had already been using Geographic Information Systems (GIS) to regulate development near known archaeological sites, but has now started using this technology to create predictive models that gauge archaeological resource sensitivity across the vast unsurveyed portions of Alberta. Another new technology—LiDAR (Light Detection And Ranging), a method of remote laser scanning—is providing detailed digital elevations models that help to better pinpoint potentially sensitive landforms. Another challenge is for the section’s archaeologists to conduct research of their own, on top of their regulatory work, since “part of our mandate is also to promote the appreciation of archaeological resources in Alberta.” The archaeologists engage in much public outreach to share their research, from writing magazine articles to giving talks at schools to participating in professional conferences. Other archaeologists in the section are working on sites in the Oilsands region. Another has been visiting local collectors in Grande Prairie, mostly farmers who over the years have gathered hundreds of very significant artefacts from their lands. He photographs these artefacts or borrows them so that they can be analysed. This is a great project, states Darryl, that gives the Archaeological Survey a better idea of the character of archaeological sites in a region where large-scale farming operations have disturbed the significant majority of sites. Through engagement with local collectors, the Archaeological Survey can also educate them about the Historical Resources Act and other public outreach initiatives. The last challenge mentioned by Darryl, like the other two, also provides an opportunity. The 2013 flood in southern Alberta destroyed homes and infrastructure, but Darryl states that “a lot of people don’t realize that…archaeological and paleontological sites were severely impacted by the flood,” as well. Archaeological sites tend to be concentrated near major river valleys because these watercourses were vital to precontact lifeways, Darryl explains. The Historic Resources Management Branch recently received $3 million to conduct exploratory surveys of the major flood-affected rivers in the Calgary region: the Bow River and its tributaries, the Elbow, Highwood, and Sheep Rivers. This project will take up much of the section’s “time and capacity” over the next two years, Darryl says. Some of the sites may have been completely destroyed, and the inventory of archaeological sites needs to be updated accordingly. But the flood also created a unique opportunity, as it has also exposed new sites not previously observed by archaeologists. Bison bone beds that were kill sites for these animals have been left “just basically sticking out—[they are] very highly visible in some cases,” says Darryl. These sites along the river are vulnerable not only to natural erosion, as unstable cutbanks are reclaimed by the river, but also to collecting by the general public. “We’re racing against time to identify and preserve these sites,” says Darryl. “We will try to protect them from future flooding, and if that’s not feasible we may excavate the most vulnerable portions of those [sites] to ensure that we have that information before the next flood takes it away.” The Archaeological Survey Section, accustomed to meeting challenges, is doing what it takes to get this work done. Written by: Gretchen A. Albers. New Uses for Old Places is a RETROactive series in which we are looking at examples from around Alberta of historic sites that have found interesting new uses for spaces that were originally designed for other purposes. In this blog post we will be looking at a building that is part way through a three phase rehabilitation project, the Wainwright Hotel. Now owned by the Buffalo Park Foundation, the Wainwright Hotel is about to experience new life. The Foundation has been working closely with Heritage Conservation Adviser, Carlo Laforge to undertake work to establish as mixed-use facility that will contain the gallery, museum and archives of the Buffalo Park Centre as well as office and meeting space on the upper floors. Preparatory work has been underway to renovate the building, with the removal of asbestos and the selective removal of materials to ready the building for Building Code improvements, including new electrical, mechanical, plumbing and sprinkler systems. The first phase will involve removing a 1960’s addition at the rear of the building and opening the main floor to accommodate the gallery and museum space. To date, the majority of the preparatory work has been undertaken by a team of dedicated community volunteers (with asbestos removal completed by a qualified contractor). The second phase of the project will rehabilitate the second and third floors of the building to allow for office and meeting space. The upper corridors will be conserved and are a character-defining element of the building, whereas the rooms themselves will be modernized for functionality. The third phase will include a new addition on the ground floor, in the location of the previous addition, and will provide loading docks and archival storage. 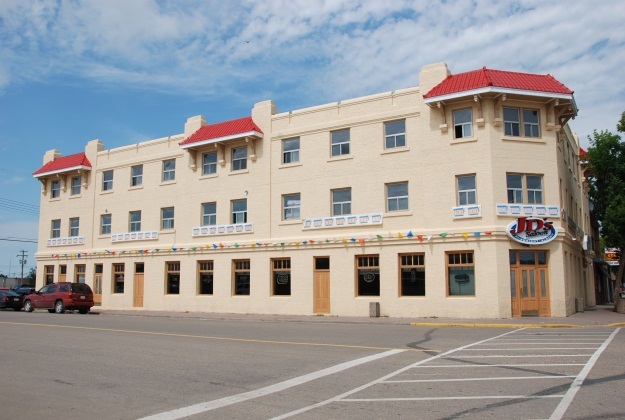 Click on the following link to access a copy of a presentation on this project given by Gord Snyder of the Buffalo Park Foundation and Carlo LaForge, Heritage Conservation Adviser with the Historic Resources Management Branch at the 2013 Municipal Heritage Forum: Wainwright Hotel PowerPoint – 2013 Forum. We look forward to seeing the results of this exciting project in years to come! New Uses for Old Places is a RETROactive series in which we are looking at examples from around Alberta of historic places that have found interesting new uses for spaces that were originally designed for other purposes. This week we will be looking at two examples of adaptive reuse projects that have involved the construction of additions to the historic fabric. As previously discussed in this series, the Standards and Guidelines for the Conservation of Historic Places in Canada offer guidelines for rehabilitating and adaptively reusing historic places. The “S&Gs” include specific provisions for how decisions can be made that will allow for the modification of buildings over time. A tenant may require additional square footage to continue operations or to start a new business in a historic place. When these situations arise and building additions are required, the Standards & Guidelines provide guidance on how to proceed. Standard Conserve the heritage value and character-defining elements when creating any new additions to an historic place or any related new construction. Make the new work physically and visually compatible with, subordinate to and distinguishable from the historic place. Standard Create any new additions or related new construction so that the essential form and integrity of an historic place will not be impaired if the new work is removed in the future. Guideline Design an addition that is compatible in terms of materials and massing with the exterior form of the historic building and its setting. Guideline Design a new addition in a manner that draws a clear distinction between what is historic and what is new. Guideline Select the location for a new addition that ensures that the heritage value of the place is maintained. Our first example, the Wetaskiwin Court House, was constructed as a three-storey, red brick building between 1907 and 1909 and served as a legal institution of regional importance for over 70 years. The court house was designated a Provincial Historic Resource in 1977 and the last court sitting was held in 1983. 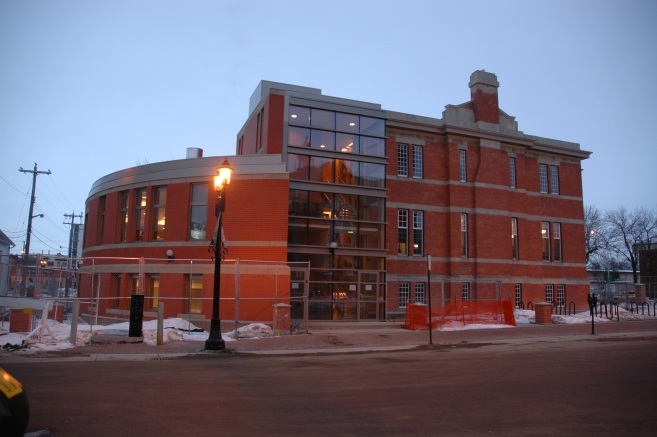 A major rehabilitation project was undertaken in 2006 to convert the building to accommodate the offices and Council Chambers of the City of Wetaskiwin. As part of the rehabilitation, two new additions were added to either wing of the building. The project involved integration of older materials with new technologies, such as the tie in of the original cast iron radiators with the new geothermal heating and cooling system. Our second example, the Strathcona Public Library in the Strathcona neighbourhood of Edmonton, is a two-storey brick structure that was constructed in 1913 and remains the oldest surviving public library in Edmonton. The Strathcona Public Library was designated a Municipal Historic Resource in 2004 and a Provincial Historic Resource in 2008. Over the years the use had not changed but the needs of the institution grew and additional space and services became a requirement. A major rehabilitation project was undertaken to construct an addition at the rear of the building (the left portion as shown on the image to the right). The rehabilitated library was re-opened in 2007. Click on the following link to access a copy of a presentation on this project given by Tom Ward, Manager of Heritage Conservation Advisory Services, at the 2013 Municipal Heritage Forum: Strathcona Library PowerPoint – 2013 Forum. These projects exemplify that heritage need not be frozen in place. There are means by which to respect and care for the original fabric while allowing for the transformation of uses over time. The Alberta Historical Resources Foundation presents Heritage Awards biennially to individuals, organizations and municipalities to recognise those who have protected, preserved or promoted Alberta’s heritage. 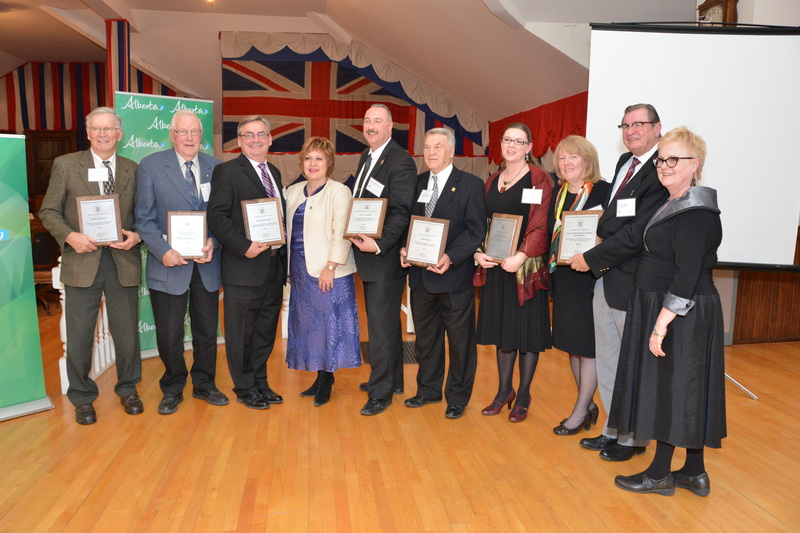 The Foundation will be accepting nominations for the 2014 Heritage Awards until July 15. Nominating a person or a group for a Heritage Award is your opportunity to help honour those Albertans whose commitment to preserving our province’s heritage must be recognised. Self-nominations are also accepted. Awards will be presented on October 16th, in conjunction with the annual Municipal Heritage Forum. The Heritage Conservation Award recognises excellent work in conserving a historic resource. The Heritage Awareness Award recognizes research or publications that enhances public understanding of Alberta’s heritage. The Municipal Heritage Preservation Award honours outstanding work by municipalities to identify, evaluate, protect or conserve locally significant historic resources. The Outstanding Achievement Award honours those extraordinary Albertans whose leadership has conserved historic resource or promoted a greater appreciation and understanding of our province’s heritage. You can download a copy of the guidelines and nomination form from the Alberta Historical Resources Foundation’s website. If you have any questions, please contact Carina Naranjilla, the Program Coordinator, at 780-431-2305 (toll-free by first dialling at 310-0000) or at carina.naranjilla@gov.ab.ca. In this edition of New Uses for Old Places we are going to look at two Provincial Historic Resources on Calgary’s historic Stephen Avenue that are currently undergoing rehabilitation. The Bank of Nova Scotia and the Bank of Montreal Building are both slated to reopen with new uses this year. In the early days of Alberta, banks were designed as statements of wealth, progress and confidence in a growing province. The buildings included lofty banker’s halls, adorned with fancy ornamentation — the ‘suits’ could look down on the tellers from the mezzanine above. The design was intended to impress investors and was conducive to the hushed conversation of financial matters. But, what do you do with grand halls when the money managers move to a modern building? Historic banks can be difficult spaces to re-purpose due to challenges with acoustics, heating and the unconventional layout of the main floor. Nevertheless, for two former banks on Calgary’s Stephen Avenue, the commitment of the property owners and the selection of suitable tenants has resulted in the revitalisation of two very significant buildings on one of Calgary’s most active streets. The Bank of Montreal building was constructed on Stephen Avenue in 1930-32 as a three-storey, steel-frame building clad in Tyndall limestone. The building replaced an earlier (1889) version of the building in an effort to modernize its image. The bank operated in this location until 1988. The most recent tenant, A&B Sound, left the building over a decade ago and it has since sat empty. Renovations are now under way to re-purpose the building to accommodate a restaurant/pub on the main floor, with 25,000 square feet of office space on the upper floors. The building was designated a Provincial Historic Resource in 2003. Just across the street sits, the Bank of Nova Scotia. It was constructed in 1930 as a one-storey steel frame, brick and sandstone structure and operated as a bank until 1976. Since that time the building has been home to a range of restaurants and clubs and is now being renovated to contain a public house. The renovation will involve re-plastering of the walls and restoration of the marble flooring in the entranceway. The building was designated a Provincial Historic Resource in 1981. Heritage Conservation Advisory Services has been working closely with the owners of both properties to ensure that renovation activities are following the Standards and Guidelines for the Conservation of Historic Places in Canada. The Alberta Historical Resource Foundation held its first quarterly board meeting of 2014 in the town of Olds on February 21st and 22nd. The Foundation’s board members and staff look forward to the quarterly meetings, each held in a different Alberta community. This allows us to meet the Albertans who work so hard to conserve and promote our heritage; seeing and experiencing the fruits of their labour is both informative and a pleasure. Once the bus got underway, Donna showed us some of the historic places the Town of Olds evaluated in 2009 (with the assistance of a Foundation grant and the Municipal Heritage Partnership Program staff). Many of these places have since been designated as Municipal Historic Resources. Our bus first stopped at the Mountain View Museum and Archives. There were several interesting displays that used locally significant historical artefacts to highlight the region’s history. We also learned a bit about their archival holdings and viewed some of the contemporary art displayed in the adjoining art gallery. Our next stop was the former Canadian Bank of Commerce, now home to [sic] Pandora’s Boox and Tea. The beautiful, classically-detailed bank building has been adapted for its new use as a book store and coffee shop. Pandora’s is in the heart of Uptowne Olds, the town’s historic commercial district. Upon re-boarding the bus, we were slowly driven up and down the several blocks that make up the Uptowne area. We admired the many historic resources in the Uptowne. Olds is one of four communities that the Foundation has accredited through its Alberta Main Street Program. We were impressed by the conservation projects currently being undertaken on several buildings in the Uptowne area (some with the Foundation’s support). We briefly visited the grounds of the Olds Agricultural Society. Olds’s large Ag society is one of the olds-est (pun not intended) Agricultural Societies in Alberta, having been incorporated in 1899. Our next stop was the Olds College. Olds College celebrated its centenary in 2013. Founded in 1913, the college is Alberta’s largest and olds-est (there I go again) rural agricultural college. The campus has evolved with the college it houses, but amidst all the modern classrooms, laboratories, libraries and dorms are at least two buildings older that the college they’ve become an integral part of: a calf barn (now home to a herd of goats) and a horse barn. Both buildings were constructed in 1911, when what is now a campus was part of a provincial demonstration farm. We ended our visit to Olds College by visiting to their state of the art brewery: an example of how the college contributing to Alberta’s future by being true to our agricultural past. The first class of brewers will graduate shortly. The tour was followed by a meet and greet at the Pomeroy Inn. Thanks to Michelle Jorgensen (Heritage Advisor, Town of Olds) for organising an informative and fun event. It was a pleasure to meet and speak with Mayor Judy Dahl, and with members of the town staff, the Mountain View Museum and Archives, the Olds Institute for Community and Regional Development, Olds College and many citizens of the area who build the partnerships that protect and promote Old’s wealth of historic resources. Everyone agreed that it was an afternoon well spent that reminded us of how important our work is; it was the best way for the board to get inspired before spending their Saturday immersed in paperwork. The Alberta Historical Resources Foundation has been collaborating with the citizens of Olds through its grant programs for over two decades. The Town of Olds has completed a full range of heritage planning projects with the assistance of the Municipal Heritage Partnership Program, including a heritage survey, inventory and management plan. As an Accredited Main Street Community, the Olds Institute for Community and Regional Development (Olds Main Street sponsoring organization) was recently awarded a coordinator salary subsidy along with marketing, economic development, organization and design grants. The Heritage Preservation Partnership Program has also provided technical advice and conservation grants to a number of Olds’s Municipal Historic Resources. Written by: Carina Naranjilla, Grant Program Coordinator, Alberta Historical Resources Foundation; and Michael Thome, Municipal Heritage Services Officer.